How to View and Download Form 26AS ? Your Tax Credit Statement or Form 26AS is an important document for tax filing. Gone are the days when one has to manually download Form 26AS for filing your IT Returns. Now, you can directly import the Form 26AS information, while filing Income Tax Returns. What are the Parts of Form 26AS? 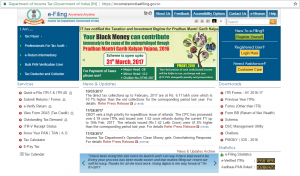 How to Use the Income Tax Department’s e-Filing Website? 1. What is Form 26AS? Details of the High-value Transactions in respect of shares, mutual fund etc. 2. Parts of Form 26AS? Part A: Details of Tax Deducted at Source Part A of Form 26AS details of TDS deducted on your salary, interest income, pension income and prize winnings etc. TAN of the deductor and the amount of TDS deducted and deposited are also mentioned. This information is provided on a quarterly basis. Details of income where no TDS has been deducted is given since the taxpayer submitted Form 15G or Form 15H. 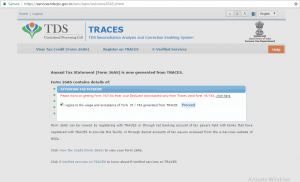 You can verify the status of TDS deduction if you have submitted Form 15G or Form 15H. If you have not submitted Form 15G or Form 15H, this section will display ‘No transactions present’. This is applicable if you have sold property during the year and TDS was deducted from your receipts. You will find the relevant entries here. If you have deposited any tax yourself, that information will appear here. Details of advance tax as well as self-assessment tax are present here. It also contains details of the challan through which the tax was deposited. Information regarding your refund, if any, will be present in this section. 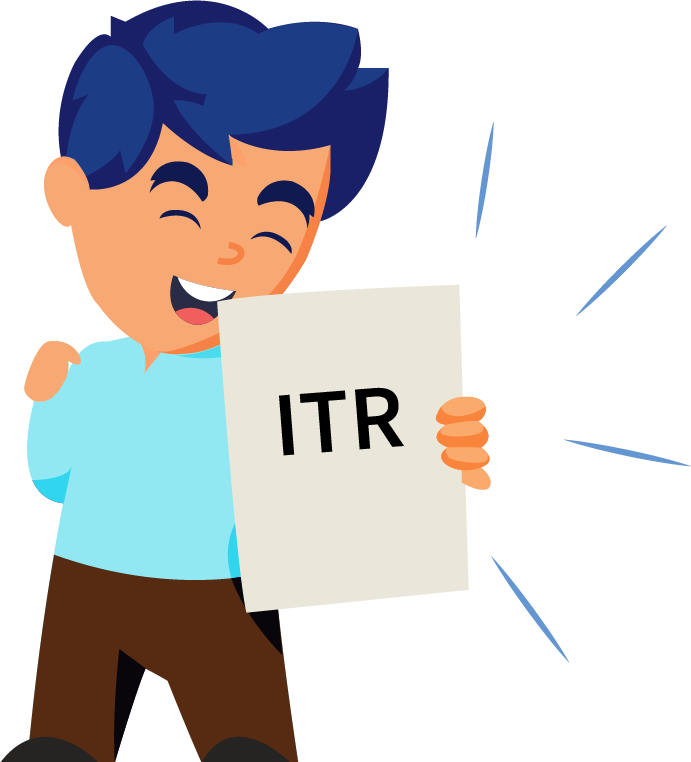 Assessment year to which the refund pertains, along with mode of payment, amount paid and interest paid and also the date of payment is mentioned. Banks and other financial institutions must report high-value transactions to the tax authorities. Mutual fund purchases of high value, property purchases, high-value corporate bonds are all reported here. If you have bought a property, you have to deduct TDS before making payment to the seller. 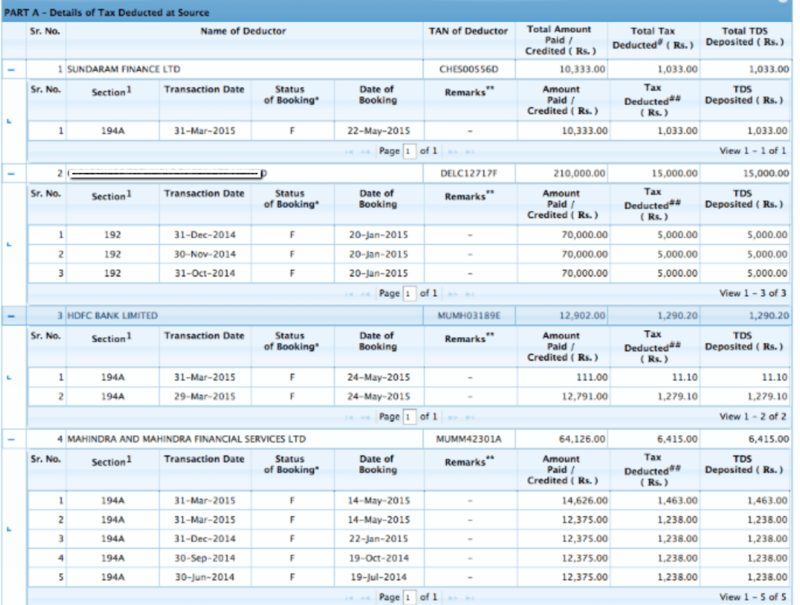 This section has details of TDS deducted & deposited by you. Defaults relating to the processing of statements are mentioned here. They do not include demands raised by assessing officer. 3. How to view Form 26AS? 4. 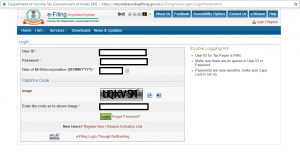 How to Download Form 26AS? a. Enter your PAN number, password and date of birth / date of incorporation in DD/MM/YYYY format. And enter the captcha code. Now click on LOGIN. 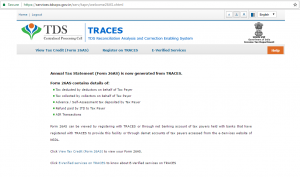 a. Click on ‘Confirm’ so that you are redirected to the TRACES website. (Don’t worry, this is a necessary step and is completely safe since it is a government website). a. 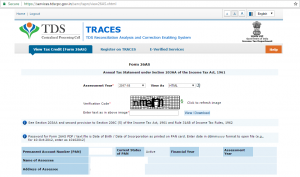 You are now on the TRACES (TDS-CPC) website. Select the box on the screen and click on ‘Proceed’. a. Click on the link at the bottom of the page – ‘Click View Tax Credit (Form 26AS) to view your Form 26AS’. a. Choose the Assessment Year and the format in which you want to see the Form 26-AS. If you want to see it online, leave the format as HTML. You can also choose to download as a PDF. After you have made your choice, enter the ‘Verification Code’ and click on ‘View/Download’. Step 8 (Final) To open the document you have to enter a password. Form 26AS password is your DOB in DD/MM/YYYY format. Voila! Your Income Tax Form 26AS will open. 5. 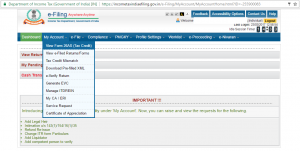 How to use the Income Tax Department’s e-Filing website? Upload your form 16, verify your tax summary and file your returns. File your taxes in 7 minutes. Also find answers to e-filing without a form 16, understanding which ITR form to file and more.